A charming Victorian cottage, beautifully renovated and furnished to a very high standard in the popular area of Fortuneswell, Portland. The famous Chesil beach, part of the World Heritage Coast, is 5 minutes walk away and the cottage is in an ideal location to explore what Portland has to offer. 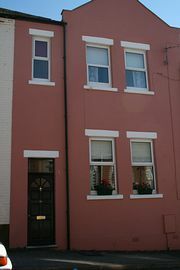 Close to all amenities Rosa Cottage is only a 2 minutes walk away from pubs, restaurants and shops. The Georgian seaside resort of Weymouth is only 4 miles away. 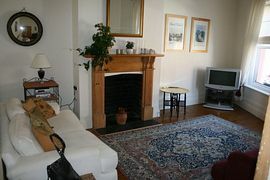 The cottage has full gas central heating as well as a woodburning stove in the living room. The living areas are spacious and fully equipped with TV, DVD and CD player. There is comfortable seating for 6 people. 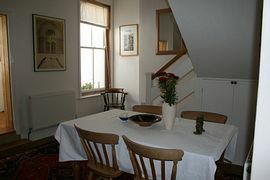 The separate dining room has a large farmhouse table which seats 6. 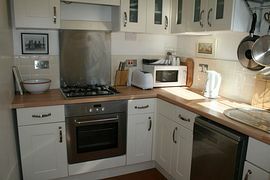 The kitchen is light and compact, beautifully finished with all the equipment you will need including dishwasher, electric oven, gas hob and microwave as well as a range of crockery and cutlery. A travel cot available on requests. The magical island of Portland has a long heritage of watersports, fishing, walking and a range of outdoor activities are available. Rosa Cottage is only a 5 minute drive from the National Sailing Academy. An ideal location for a varied holiday. 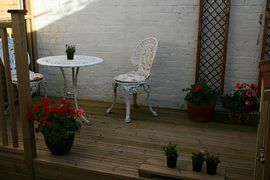 Small courtyard garden with decking and furniture. From Weymouth follow signs to Portland. Drive through high street and just after shops you will see turning to Hambro Road on right hand side. the cottage is located half way down Hambro Road. Detailed directions and map will be provided on booking. Spring: Maximum: £450.00 per week, Minimum: £350.00 per week. Summer: Maximum: £600.00 per week, Minimum: £450.00 per week. Winter: Maximum: £500.00 per week, Minimum: £270.00 per week. Bookings are from Saturady to Saturday. Weekend breaks available in low season. The Cottage is awaiting grading. It is anticipated a grade 3 or 4.